What is the Champlain Longboats Program? The Champlain Longboats Program is an innovative boat-building and rowing program that partners the Lake Champlain Maritime Museum (LCMM) with regional schools and community organizations. The primary goal is to develop positive, healthy behavior in middle and high school students at a critical time in their lives by exposing them to the innate team / self esteem-building nature of boat building and rowing. Initiated by LCMM in 1999, Champlain Longboats has two distinct but interconnected pieces: the boat building program, an intense five-month project with up to 12 students participating five days a week, and the rowing program which uses the boats built by the students for in-school education, after school extra-curricular programs, and community rowing. Over 700 youths and 200 adults participate annually. We accept boat donations which we use to help fund this program. Have a boat to donate? Go here. Or see the list of boats for sale. "Your work at LCMM is vital, far-reaching, and life-changing. I am full of gratitude for your vision and your quiet ability to make it real for so many to benefit from." Champlain Longboat programs start with a visit to trees in the forest with the program’s collaborative partner Vermont Family Forests (VFF), a county wide non-profit that promotes sustainable forestry practices. Student teams travel with a VFF forester to visit the forest and then participate in the milling and stacking of the boat building lumber. Following the process from tree to lumber to finished boat, students gain a vivid understanding of why it is important to be responsible stewards of our precious forest resources. Students come to the LCMM boat shop five-days a week for five months to build a 32' foot rowing gig. Students learn to use woodworking tools, collaborate with peers and program staff, and understand what it means to function effectively in a working environment. They also keep journals, work out on rowing machines, perform research, and give presentations on boat-building topics. The boat launch in the spring is a celebration. Everyone is invited to see the new boat and hear student builders share their experience. To see a project of this duration and magnitude through to completion is a new experience for all the participants. Accolades and positive feedback from the community and their peers reinforce the notion that they can accomplish what they set their sights on. LCMM’s inclusive “you show, you row” policy involves over 700 youth annually in the Champlain Longboats rowing programs. The youth rowing program provides a positive option for a diversity of students including those who aren’t inclined to participate in more traditional school sports. 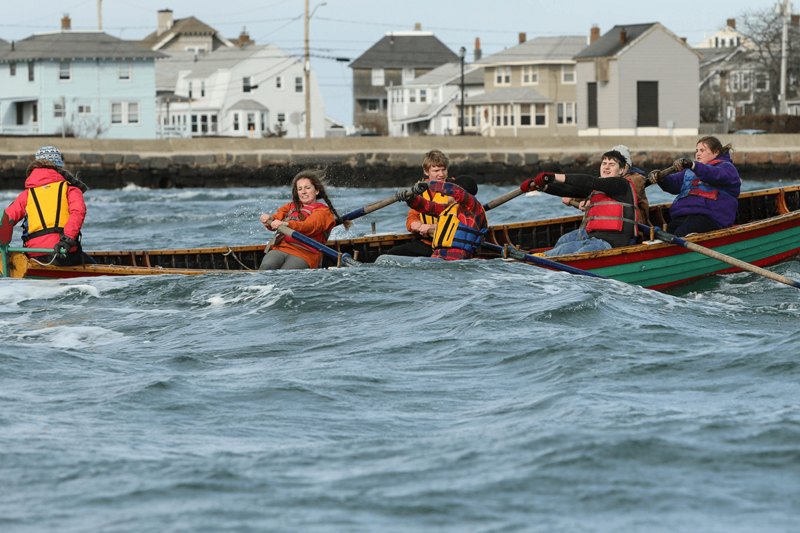 Extra-curricular rowing teams practice two to three times a week, participate in LCMM’s three annual regional rowing races and travel to three youth rowing competitions sponsored by the Hull Lifesaving Museum in Massachusetts. Our youth rowing programs create a rare environment where special education students participate seamlessly right alongside their mainstream peers, without stigma attached. People are judged by how they participate not by what disability or diagnosis they have. Special education and mainstream education programs also use our in-school rowing programs. These programs focus on team-building, ecology, and regional history while they experience the natural history of the Lake Champlain eco-system. The Champlain Longboats Community Rowing Club offers adult rowing every week June through September. Community members sign up to regularly experience the beauty of Lake Champlain while getting a great physical work-out. Adult community teams also participate in regional rowing competitions. View the current schedule. "Our rowing family keeps growing, season by season, school by school, and race by race."